As we know banner ads is the most powerful tool to flash your presence to the target audience of the automotive industry. You can promote your company / services all a most competitive price. We assure solid enquiry for all of our customers. Various plans are available to meet your expectations. The following are the Benefinary, people, who can develop their business by becoming a member of Automotivedirectory.in and utilize the advertisement concepts. Maximize Exposure! Maximium Brand Awareness is Guaranteed! 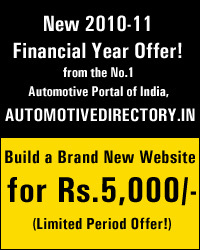 Automotivedirectory.in, E-Newsletter Advertisement plan provide the golden cost effective opportunity to significantly enhance your sales and marketing program. No matter Whether you�re already participating in print, trade shows, direct mail campaign or more, our proven E-Newsletter advertisement plans will surely give a better Instant Return on Investment which possible by our powerful Internet Marketing support. By Advertising your products/service in our E-Newsletter Advertisement Plan, you will be connect with your target automotive audience instantly. Ask Us How? To Optimize Sales and expand automotive businesses beyond boundaries through Powerful Lead Generate Tools namely E-Newsletter Advertisement Start Now!